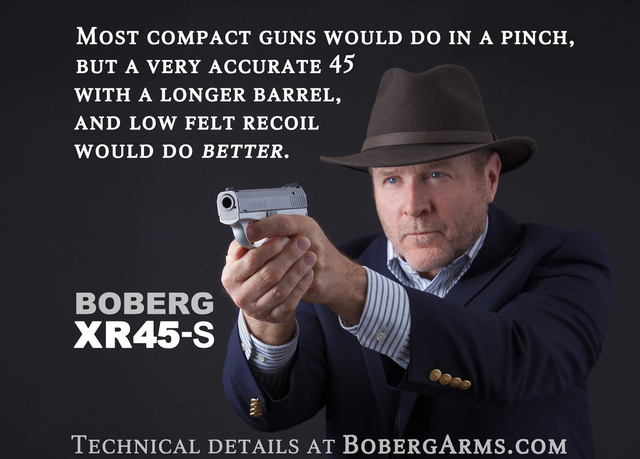 I currently carry XR9L and 9S pistols as the compact/subcompact options, and recommend XR45S for those who prefer larger bores. You can get cheaper subcompact guns, but none combine the long bullpup barrel, the low recoil of rotary breech, the extra round held by the magazine that doesn’t require a follower, and the precision machining ensuring the gun’s longevity. I think that Arne Boberg is a brilliant designer and a competent engineer to make his concepts work well. This entry was posted in pistol, weapon and tagged 45ACP, bullpup. Bookmark the permalink. Nice up-dated version of the old “Mars” pistols. With Maxim MG and Steyr 1907 and a whole lot of other features added. Internally, it’s different from Mars — for one, it has fully controlled feed and extraction. Found the pocket pistol version on Joe Salter. To what extent does the .45 version suffer from the problem of pulling cases off bullets during feeding? I would expect (unless the design has been modified to address the issue) that it would be worse than in the 9mm, since the bullet:case weight ration is higher for a .45 ACP cartridge them a 9mm. Neither 9L nor 45 appear to have the issue, it’s largely limited to the 9S version. That doesn’t make much sense. Isn’t the mechanism used to pull out the cartridges the same in all versions? The mechanism, yes, but the different barrel/slide length would change the acceleration of the cartridge backwards out of the magazine. Spreading that force over a longer period of time would reduce the likelihood of the bullet coming loose from the case. Ah.. so.. same backwards momentum, but the heavier slide moves more slowly, so the cartridge is pulled out less abruptly and thus is less likely to come apart.